Many fossil mammals ofthe Pleistocene are regarded as typical of the Ice Ages that affected large parts of the world—animals such as the mammoth, woolly rhinoceros, giant Irish deer, giant cattle and cave bear. These all disappeared, however, in relatively recent times and there is considerable interest in trying to establish just what happened and why (Martin and Klein, 1984). The Pleistocene Epoch (2-0.01Myr ago) is marked by many ice ages, during which the ice sheet covering the North Pole advanced southwards and blanketed parts of Europe as far south as Germany and England, northern Asia and Canada. Ice also advanced outwards from the Himalayas and the Alps, and there were major climatic changes throughout the rest of the world, including drying episodes as so much water was locked up in the ice. Between the ice ages, there were intervals of warmer weather, the main ones being interglacials, during which elephants and hippos roamed around England. The last ice age ended about 11,000 years ago. Some time between 12,000 and 10,000 years ago,the mammalian faunas of most continents underwent major changes (extinctions in Australia had already happened, before 20,000 years ago). In North America, for example, 73% of the large mammals (33 genera) died out, including all of the proboscideans (mammoths, mastodonts), the horses, tapirs, camels, ground sloths and glyptodonts, as well as various predators and deer (Figure 10.46). In South America, 46 genera died out (80%), including species of edentates, rodents, car nivores, peccaries, camels, deer, litopterns, notoungu-lates, horses and mastodonts. In Australia, 55 species vanished, including echidnas, marsupial carnivores, wombats, diprotodonts, kangaroos and wallabies. In Europe, on the other hand, the losses were less severe. True, the woolly rhino, mammoth and giant deer died out, but others, such as the horse, hippo, musk ox, hyaena and saiga antelope, simply contracted their ranges to other parts of the world. Extinctions in Africa and Asia at this time were seemingly modest. At first sight, it was the large mammals that suffered most, but is that really so? Johnson (2000) has shown that the victims were slow reproducers. The survivors tended to breed faster and to be more cyptic (i.e. living in forests or on mountains). It just so happens that most (but not all) victims were large and most survivors were smaller. Beware of spurious correlations! ments changed rapidly as the ice sheet retreated, and that the large mammals in particular were vulnerable to such disturbances. The second view is that spreading human populations exerted pressure on the larger mammals in particular, and they were wiped out by hunting, the so-called 'overkill hypothesis'. been extinctions among the smaller animals and plants. They also ask why the climatic changes in Europe had little effect, and why earlier glacial retreats did not cause extinction. On the other hand, the 'climatists'point to the lack of archaeological evidence of kill sites, and the fact that humans entered Australia long before the bulk of the extinctions took place. They also ask why species that were probably not hunted also died out. 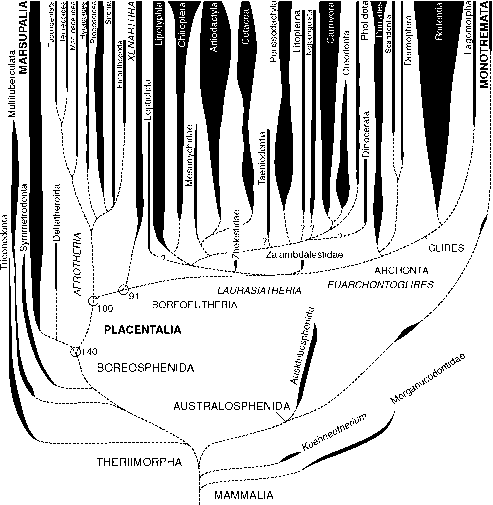 A reanalysis of the data on dating and geographical spread of the extinctions in North America (Beck, 1996) suggests that the process happened in reverse of what might be expected from the overkill model. The extinctions of large mammals occurred from south to north, perhaps in line with retreating glaciers, not from north to south, in parallel with the advancing human populations. The debate has become highly polarized. 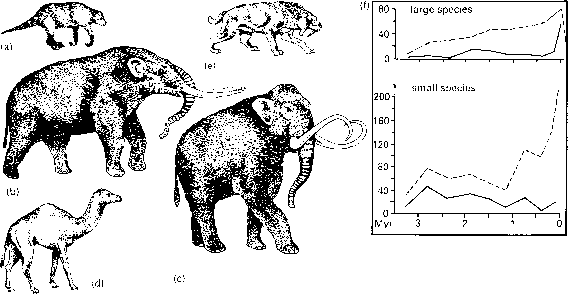 Alroy (2001) strongly supports the 'overkill' hypothesis with a mathematical analysis of human and large-mammal population dynamics through the latest Pleistocene. His approach is rejected by Brook and Bowman (2002), who suggest there is no evidence for overkill. Grayson and Meltzer (2003) further state that the overkill model is removed 'from the realm of science and place [d] squarely in the realm of faith' because of lack of evidence. Of course, the extinctions might have been the result of a combination of climatic deterioration, followed by human slaughter as the final straw.